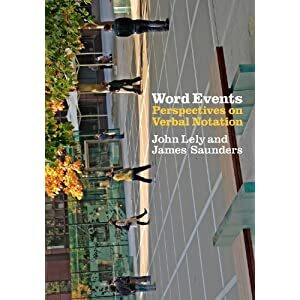 Word Events, by John Lely and James Saunders, is a remarkable, thought-provoking, sometimes frustrating but ultimately valuable resource. Much like many of the 150-plus text scores contained within its pages, in fact – a correspondence with which its authors, both composers themselves, would no doubt be pleased. Although it is subtitled ‘Perspectives on Verbal Notation’, Word Events is better understood as a critical anthology. An opening chapter by Lely ‘On the Use of Grammar in Verbal Notation’ attempts a framework for the analysis of text notation, but it is only partly integrated into the rest of the book and stands out on a bit of a limb. The rest of the book anthologises a range of text scores, by composers and artists from Erik Satie to Daniel James Wolf, Sol Le Witt to Bill Drummond, taken from a corpus of more than 2,500 collected by its authors. Each score is accompanied by a statement from the artist – many of them specially written for this book – and most are followed by a commentary/analysis written by either Lely or Saunders. The statements and commentaries range from the epigrammatic (Yoko Ono) to combinations of performer interviews, photo documentation and essays (Seth Kim-Cohen). Without a doubt the book’s most important contribution is to collect together so many text scores in one place. And such a range – from famed (but not always accessible) classics by George Brecht, Alvin Lucier, Max Neuhaus and La Monte Young, to comparative obscurities by Tony Conrad, Takehisa Kosugi and Howard Skempton, to recent examples by Antoine Beuger, Mark So and Michael Winter. Many readers will surely spend their first hours as though at an all-you-can-imagine conceptual music buffet. And since in many cases to read is to perform, it functions as much as a gallery or a recital as a book. Time spent in its pages is a joy. And while few important text composers are left out, many have been represented by works that are less well known, or less obvious. There is a laudable sense that we are being shown a body of work, or a field of activity, rather than being force-fed a canon. A similar skewing of bias may be interpreted from the amount of attention given to each work: Kim-Cohen’s Forever Got Shorter receives more attention, for example, than works by Cage, Cardew, Ono or Stockhausen. This is also reflected in the work’s alphabetical layout, which eschews any attempt to impose a historical or stylistic order. Nevertheless, a cover-to-cover reading suggests a subtle composerly hand behind the apparently objective sequence. Concluding with Young’s pieces, perhaps the most famous works here, cannot be an accident. And Amnon Wolman’s February 26, 2000, the only work to deal entirely in imaginary sound, is saved for second to last, ensuring the possibilities of the medium remain fresh until the very end. Yet despite all these positives, there are still frustrations. Typography is not discussed: many scores have been reformatted for this book, but others are given in facsimile. What is the difference? How do font, handwriting style, page layout and so on contribute to a score’s effect and efficiency? One or two composers allude to this (Howard Skempton is one), but much more might have been said. Which begs the question: what of text scores in languages other than English? Despite the international profile of the composers represented, every score here is written in English. There are no translations (although a couple of pieces are written in bi-lingual versions). Is verbal notation a uniquely Anglo-spheric practice? Why? What might and/or does a culture of verbal notation look like in German, Russian or Japanese? These might be questions for another study, but there are implications for the present book. What is the impact, for example, of a Swiss or Japanese composer writing in a language other than their mother tongue? When such analytical attention is being given to minute variations in grammar, what allowance must be made for unidiomatic usages? And when does this become a point of style? The alphabetical ordering has many benefits, but one does begin to miss a sense of history. A chronology of works can be unpicked, but not a picture of the influences, streams, nodes, breaks, clusters, etc. that comprise actual history. Readers looking for a wider cultural historical context for these pieces, or a sense of how they relate to one another will search in vain. A final complaint is simply practical: there are no composer biographies. Not much is needed – just a couple of lines for each composer. But without this, the reader is left to Google or guess. My other complaints might simply be subjects for another book; this one, however, feels like a significant gap. And yet, in spite of these flaws, it remains a collection unmatched for its depth and breadth. It is particularly valuable for its presentation of word scoring as a current and ongoing practice. It presents a useful first attempt at an analytical method. It incorporates many original composer statements and a wealth of unique or previously unavailable material. It applies a scholarly tone to material and a practice that is often discussed only in journalistic terms. And it returns to the light a number of previously overlooked and important figures.